Tandem Ride On Roller Rental – Bomag 90-AD-5, available for rent in Rochester NY, Ithaca NY and the entire Western New York region, has an operating weight of 3,527 pounds. 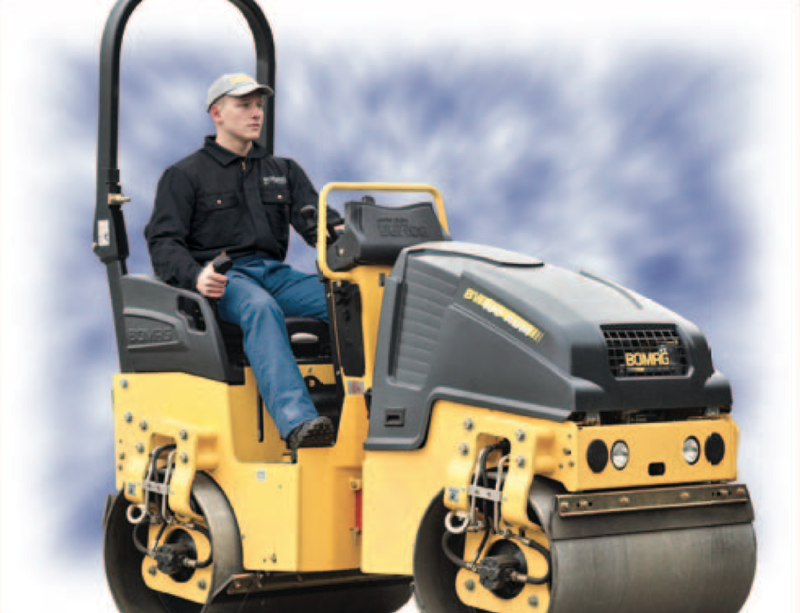 This rental tandem vibratory roller has a top speed (with vibration ) of 2.8 MPH. For transport, the roller has a top speed of 6.2 MPH. The macjhine offers clear operation and indicator controls and ergonomic steering for comfort, wind screen protected water spray nozzes with integrated filter for uniform coverage adn maintenance free bolt on articulated / oscillating joint. Notable features: hydrostatic travel and vibration drives, front and rear drum vibration, front or rear drum vibration lock out, ride-on-protection system with reractable seat belt.